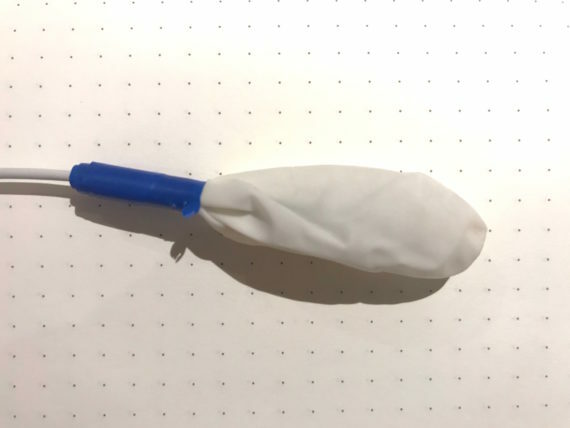 Apple mic within a latex cover. I decided to cover the Apple mic (mentioned in previous blog post) with a finger cut from a latex glove, firstly to keep moisture out of the microphone and secondly to get rid of sharp corners that could catch on my throat. I finally braved an attempt at getting the mic down my throat. Unfortunately due to the 4cm length of the hard plastic section of the mic, I just couldn’t get it to go around the bend of my throat at the back of my mouth. My fingers couldn’t reach to push it, and the wire is so soft and flexible that it doesn’t help to push the mic at all. It was so frustrating! I decided to hold the mic in my mouth to see what sort of sounds would be produced – the Apple mic is incredibly sensitive and good at picking up even small sounds at a distance, so I was hopeful that there would be some visceral sounds captured from within my mouth through sucking and breathing and generally moving my tongue around the mic. 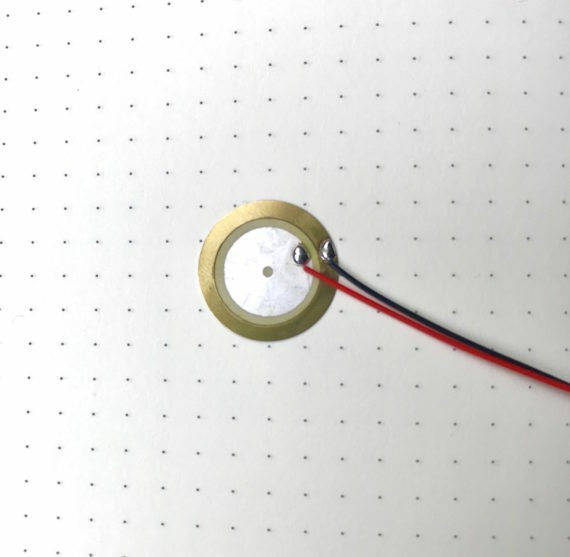 Annoyingly, this experiment left me frustrated again, as the only sounds that I seemed to collect was the scratchy sound of friction as the mic rubbed against the surfaces of my mouth. Instead of the squelchy visceral sounds I had hoped for, I was left with crackling, rattling and scratching. I am finding this to be slightly infuriating! To collect the sounds that happen inside the body seems like a simple concept, but I am starting to worry that it is in fact impossible! Sketch: a plan of action. As usual when I feel like I’m getting nowhere I turned to the internet for inspiration, (or procrastination!) I found a Youtube video where someone showed how he had managed to connect a stethoscope to a microphone. I know I have talked about how I thought that instruments that collect sound from outside of the body would not be what I would want to make use of – I previously described how I thought that they seemed like secondary sounds and that they would not hold the integrity of sounds collected directly from within. But… I think that for the sake of trying to progress this work as part of the fellowship I need to try everything out. I try to remind myself that it is important not to box myself in with my experiments by making rules for myself of what is and isn’t okay. I have realised though, that when you have very little kit that it can be difficult to test things out. I don’t own any sound equipment so to be able to experiment with a microphone I needed to buy one first. There’s actually a lot of kit that I will need to invest in if I am to continue to play with sound. For example, to be able to record sounds to my laptop, which I definitely will need to do if I am to make a circuit using sound, then I will need to invest in the right equipment. I think this is an aspect of working with technology that has previously put me off. The not knowing / understanding how the equipment works, the worry that I may buy the wrong kit and the general lack of funds has meant that this way of working has not been accessible to me. This is where the Fellowship has been really useful. I have access to people like my mentor Ben Sadler who has the knowledge to be able to advise me, and I am hoping that Random String will be able to help me accumulate some equipment that will help with this process. Going back to the stethoscope, I decided that I needed to invest in this idea. I bought a stethoscope which was not expensive at all and I also bought a condenser mic, which I am sure will be useful in the future outside of this experimentation. I really enjoyed sitting with the stethoscope placed on my chest, listening to the rhythmic lub-dub of my heart. It was mesmerising. It felt like a really magical experience – to be listening to the one muscle that keeps me alive. It so easy to forget that this incredible machine is working so hard inside, so when you connect with it, feel it and hear it the body suddenly feels like something bigger and more incredible than any technology that is man made! (I have to find a way to share this experience with others). 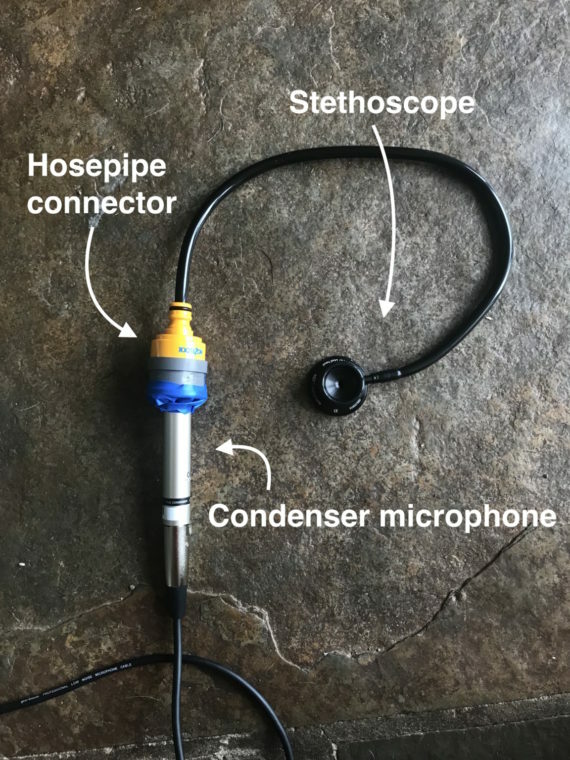 I followed the instructions of the video, expecting that by attaching a condenser mic I would be able to amplify the rhythmic sounds that I had heard through the stethoscope…. I was wrong!!! It amplified some noises, but definitely not the noises I had heard. 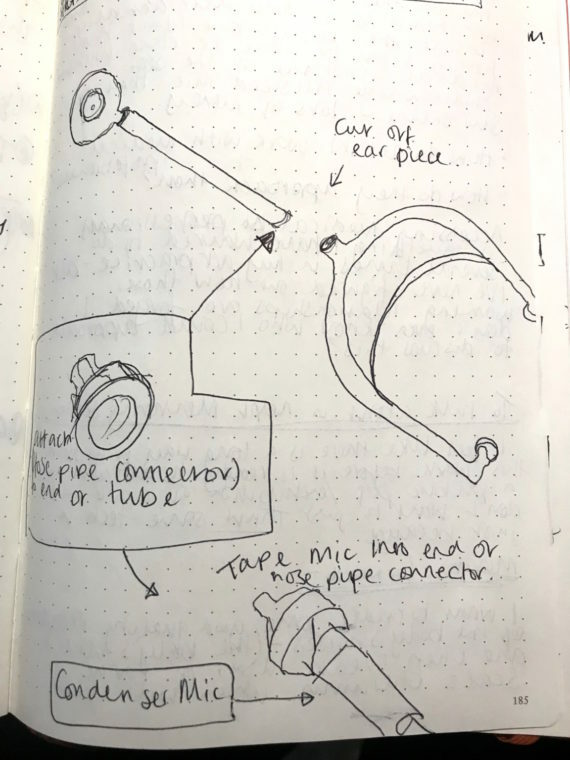 I sat thinking about this and I realised that, when I think about how a stethoscope works, maybe I had just made a large contact mic?! I really thought it would work. Maybe talking it through with Ben at the next session I will be able to make some sense of it, and hopefully I will find a way to move forward. It feels like time is passing so fast and that there’s just not enough time left of this Fellowship to move as far forward as I would like. My last mentoring session saw me arrive at a point where I knew that I wanted to move forward experimenting with making and collecting soundscapes using the body as a source. I had talked to Ben about how I would like to find a way of collecting sound directly from within the body, opposed to using external tools to listen in. In my mind this listening in from outside seems secondary, whereas to hear sounds as they actually happen from within seems to have integrity with my initial thoughts and reasons for wanting to collect the sound. Conceptually I am intrigued with the notion of how we occupy the body of another whilst we live in the womb. To live inside another body accompanied by this seemingly endless visceral soundtrack of the body is something I hope to create / signify through this work. I imagine there to be a duality of reactions to the experience, where the rhythmic sound would be comforting whilst the visceral sounds may repulse. In a way, I suppose I hope to create a body within which we can spend time being; connecting with both our own body and our forgotten memories of the body of our mother. When thinking about how to collect the sound a funny memory from childhood surfaced. I remember myself and my brother holding one end of spaghetti whilst swallowing the rest of the strand. We would then slowly pull the spaghetti strand back up, out of our stomachs! (we do strange things as children!) when this came to mind I wondered if it were possible to do this with a tiny mic. If I could find a mic small enough then maybe I could use this as a method for collection of sounds. Unfortunately very small mics seem to be very expensive and I struggled to find a mic that could be suitable. Image: Albert Swiston/MIT Lincoln Laboratory. 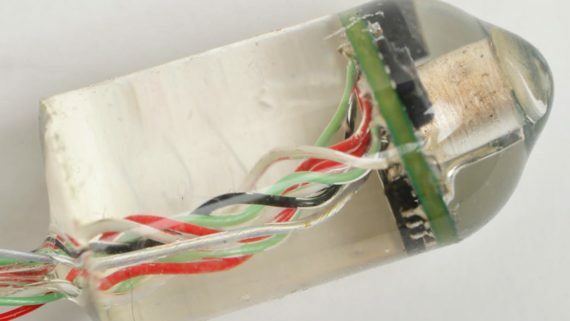 During my research I came across an article by Massachusetts Institute of Technology (MIT) about how a small silicon pill with a mic inside had been developed to generate accurate data about heart rate and respiratory rate of a patient. Click here to see video. This technology is exactly what I need to make this work!! This discovery brought to mind the question of artistic collaboration with the medical world. There have been several points in my art practice where an opportunity to seek advice from or work alongside or in collaboration with a doctor or medical professional would have been incredibly valuable. I have often wondered how those types of working relationships are developed? How do you make initial contact with medical professionals? I have never known where to start with that method of research and I wouldn’t even know where to go for advice on the matter. I have always been fascinated with the medical aspects of the body, which is probably why my practice has taken the path that it has. I remember feeling envious of a friend who whilst training as a doctor told me how he had attended autopsies, worked with cadavers, watched operations etc. When I have read about artists who have studied anatomy where they made drawings in response to sitting with and observing cadavers I felt very envious. I have always been intrigued with the invisible unknown inside world within our bodies. 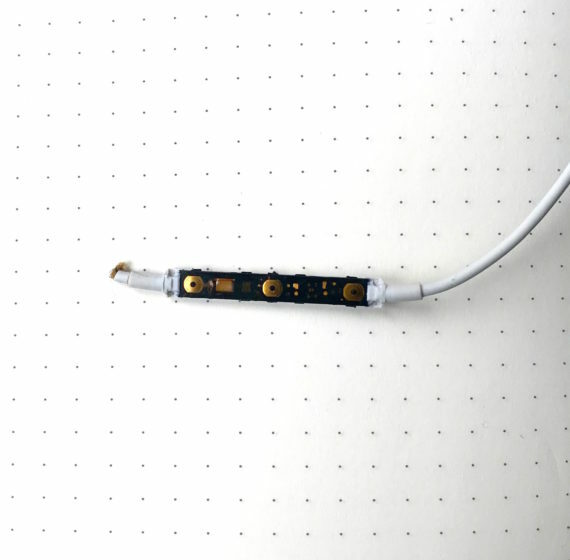 Stripped down mic on Apple headphones. Going back to the issue of finding a mic small enough to swallow, Ben had the genius idea of stripping down a set of Apple headphones that have a microphone. The mic in the headphones was tiny but it was fitted into a strip of plastic which also held the circuit for the headphones. Whilst this strip is very thin it does measure 4cm in length. During our mentoring session we made sure that the mic would work in fluid, which it did, and Ben also showed me how to connect it to the sound editing software, Audacity so that I could make recordings. Swallowing the mic was something I wanted to do privately, (which I am sure Ben was more than happy about – nobody wants to sit and watch someone gagging!!) so I took the mic home with me to play with after our session. Whilst the method of collecting sound was still questionable and not guaranteed, the fact that it is clear that sound is something I want to explore meant that Ben devised this mentoring session as an introduction to the various bits of sound equipment, how they work and how to use them. This was a very useful session as I had no idea where / how to start. 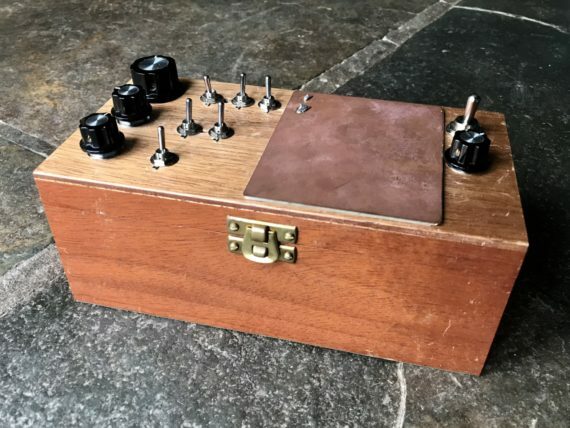 From the basic exercise of wiring up and soldering a transducer mic to looking at more technical projects such as this box made by Ben a while back using a Theremin kit (I’ll talk more about this shortly). I think just going through each part of the tech, even down to learning how different jack connections work helped me to understand things better. There is something about knowing the anatomy of the tech and how it all works that makes me feel less intimidated and more confident to experiment with it all. Ben showed me how by using kit such as a reverb pedal or an audio mixer different effects can alter the sound that you are using. This whistle stop tour of sound equipment was definitely a valuable experience for me. Going back to Ben’s sound box, I found it to be visually gorgeous and I loved the tactility of it. The switches are asking to be flicked! I liked the way that it is seemingly functional and utilitarian, but in actual fact it is like a box of madness, making sounds that are unpredictable and noisy. This odd juxtaposition is humorous to me. The importance of touch in this box was very interesting to me also. I liked how the touch of a hand on the copper plate, (which acted as a proximity sensor) left a residual trace/mark – like a ghost of another’s experience. I found this box to be inspiring and I talked to Ben about how I’d like to develop something similar, but making use of an action that frequently features in my performance works. Action from Following IN//Footsteps OF. Photo credit: Julia Bauer. During the action I hold an object, (this has previously been my children’s teeth, broken bits of bread, egg shells etc) with my arm outstretched to the side and back enough that I cant see it in my peripheral vision. The weight of this object as well ads the weight of my arm which fights to resist gravity eventually becomes too much for my arm to bear, and it drops to my side. This action is a metaphor for the weight of the hidden things women carry with them, e.g. : the pain of miscarriage, the weight of expected fertility, the weight of society’s expectations on women and their bodies… the list goes on. This action of resistance always feels like such a powerful thing to do and to experience. I had wondered whether sound could be brought into this action. A proximity sensor could be used so that as my arm lowers sound increases//as my arm raises the sound decreases in volume. 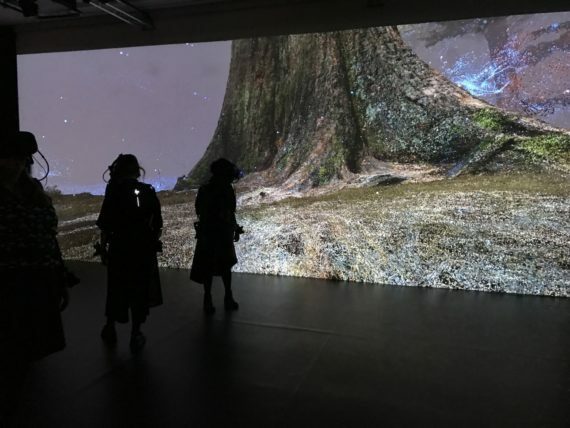 I imagine the increase of noise to be unsettling – like an eruption of visceral abjection through the rupture of pain and failure during the action. In a way, it is a Theremin on a grand scale. I imagine the space between my arm and my body to be activated through the sound, amplifying the power of the absence within this liminal space – the space between. Moving forward from this mentoring session I have plenty of things to consider and work with. I am excited moving forward to see what emerges.